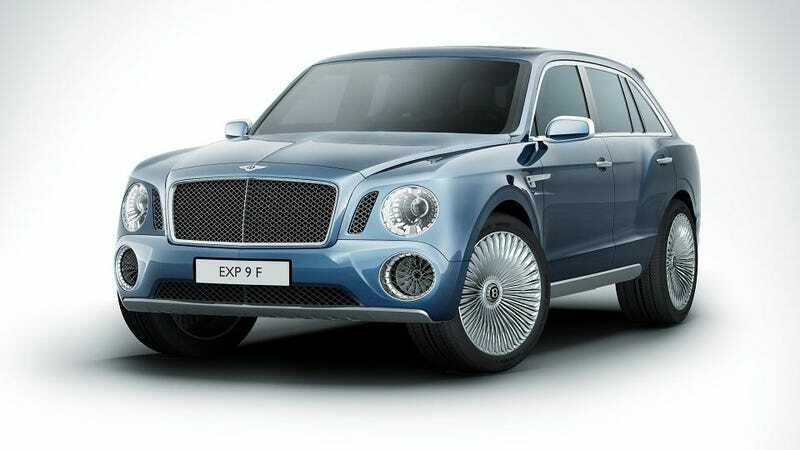 The brutal reality of the modern automotive market seems to have sadly won another round over tradition and good taste: Bentley just unveiled its long-rumored SUV concept, the curiously named EXP 9 F, at the Geneva Motor Show. Footballer wives rejoice! Spy Photos: Bentley SUV Mule? The EXP 9 F looks exactly like what would happen if a Range Rover Sport and a Continental GT got it on without proper preventative measures. Power is provided by the corporate twin-turbo W-12 spinning an 8-speed automatic, and the interior is the expected, if still glorious, gentleman's sitting room upholstered in leather and wood and metal trimmings. The press release maintains some front of discretion, stating only that the EXP "...could herald a third Bentley model-line alongside the bespoke Mulsanne and the high performance Continental GT, GTC and Flying Spur." We will be deeply surprised if a production model does not appear in the next few years. Admittedly, the EXP is not the shock it would have been in a pre-Cayenne world. We reserve the right to think that familiarity in this case is still not a good thing as we puff cigars and drink stiff scotch.